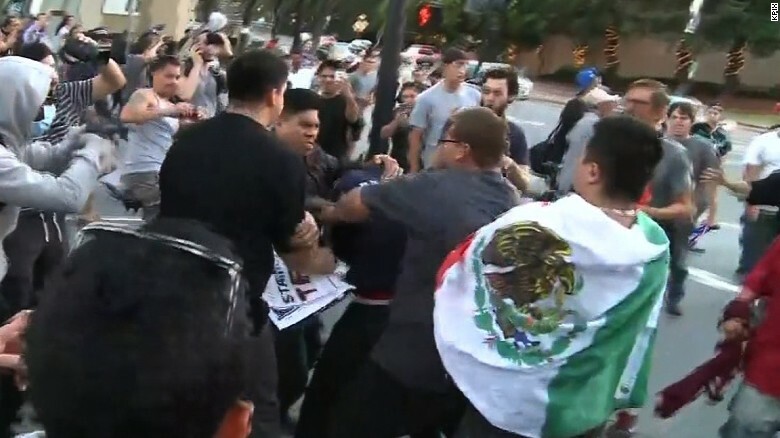 (CNN) Protesters and supporters of Donald Trump clashed in the streets of San Jose, California, Thursday night after the presumptive GOP nominee held a rally. Protesters waved Mexican flags and one could be seen burning an American flag, with another burning Trump's "Make America Great Hat." Some chanted "F--- Donald Trump" and "Donald Trump has got to go" outside the San Jose Convention Center, where Trump held his rally. As Trump supporters exited the rally, protesters shouted insults at them and accused them of being racists. As the demonstrators bunched around the event, riot police pushed many of them back. A woman made it through the protesters, taunted them and waved her middle finger back to their screams. She was cornered and egged immediately. Scuffles broke out between pro- and anti-Trump demonstrators. At one point, a man was sucker-punched and knocked to the ground and police arrested his assailant. In another instance, demonstrators closed in on a Trump supporter and started punching him in the face, and a Trump protester tried to protect the man being attacked and help him and other Trump supporters move safely through the crowd. The San Jose Police Department said they made a few arrests after the rally, but didn't provide specifics. There was no significant property damage reported but an officer was assaulted, a statement said. More details would be provided Friday. The protesters spilled into the nearby streets, with some standing on cars. Some held signs that read, "We need socialism" and "A vote for Trump is a vote for fascism." Hillary Clinton campaign chair John Podesta condemned reports of violence on Twitter, writing, "Violence against supporters of any candidate has no place in this election."